Kununurra is an isolated yet modern town which was a construction for the Ord River Scheme back in the early 1960s. Kununurra is now the gateway town to the East Kimberley, providing access to many of the area’s main attractions. Kununurra is located 1043km north-east of Broome, on Miriwoong country. Kununurra is the home to an assortment of spectacular rivers, lakes and waterfalls. Being the Kimberley’s youngest town, Kununurra was first established in 1961 as the main centre for the Ord River Irrigation Scheme. The name comes from the word “Goonoonorrang”, which in the language of the local Mirrawong people, means “big waters” or “big river”. 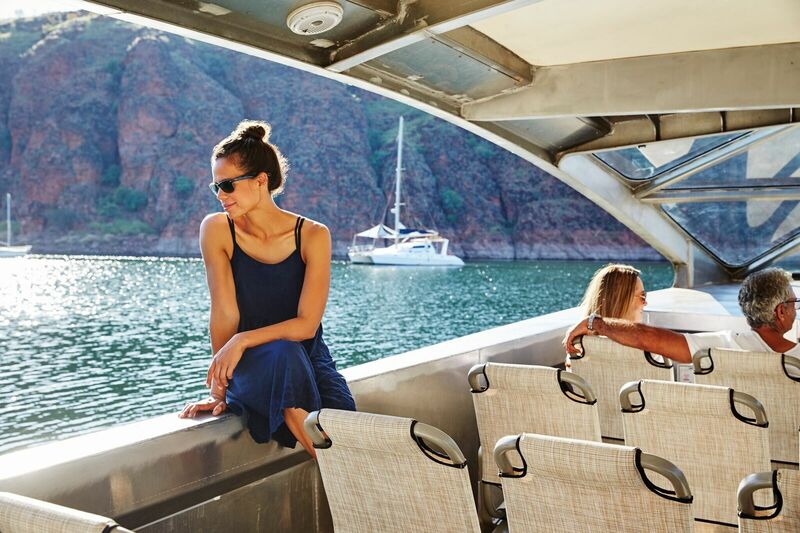 In 1962 Lake Argyle was created due to the construction of the Ord River and Diversion Dams. This helped to develop 14,000ha of irrigated land. A wide range of crops are produced in this area including: bananas, citrus, chickpeas, mangoes, melons, pumpkins and sugar cane. Later, renewable power was provided to the area with the construction of a hydro-electric power station at the base of the Ord River dam. 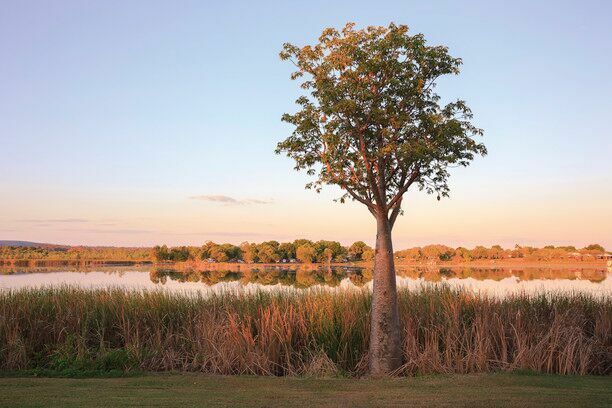 Kununurra is a town of many wetlands, rivers and lakes. During the dry season the Ord River was once a series of waterholes; but now it’s a permanent waterway. There are tours from Kununurra and Lake Argyle to discover these dramatic waterways and lakes. As well as swimming holes and spring-fed waterfalls which are only a short drive from town. Mirima National Park (which is located north of Kununurra), is another amazing attraction sometimes described as a mini-Bungles. These 350-million-year-old rock formations are a significant place for the Miriuwung people. At the end of an adventurous day you can head to Kelly’s Knob; a popular place to enjoy spectacular sunsets. Kununurra offers many accommodation options, including resorts, apartments and hotels. Hotel Kununurra was established in the early 1960s during the Ord Irrigation Scheme. This property is an important meeting place for the community and is known locally as “The Pub”. Another accommodation option is Lakeview Apartments. With beautiful views of Lily Creek as well as the Kimberley landscape. The Lakeview Apartments are located only 800 metres from the town centre. If you’re looking for a premium resort consider the Kununurra Country Club Resort. Conveniently located only 5km from the airport and with spectacular natural wonders such as Lake Argyle and the Ord River nearby. Kununurra Country Club Resort is centrally located with modern open plan rooms amongst tropical surroundings. Only 1km out of the town centre you will find the Ibis Styles Kununurra Hotel. Situated only 4km from the airport, the Ibis Styles features a bar, restaurant, BBQ area and swimming pool. The amazing Mirima Hidden Valley National Park is only 3km away, with other attractions such as Kelly’s Knob a short drive away. With over 20 years’ experience as a specialist travel wholesaler, Broome, Kimberley & Beyond are experts in tours and accommodation in the Kimberley region. Our team has extensive knowledge for every kind of traveller. For more information or to begin planning your next adventure, please contact our friendly team on 1300 245 565.